The environmental and nutrient impact of our food choices had been on my mind for several weeks when a year-old article in the Telegraph recently came to my attention, prompting me to assemble the thoughts that had been gradually coalescing. During the World War II the British were encouraged to ‘Dig for Victory’. Garden vegetable plots were at their height and allotment demand peaked. Homegrown produce allowed farmers to focus on grain and dairy production — activities ill suited to small-scale urban plots. So, what was the contribution of homegrown efforts to the national diet? How effective could it actually have been? Here are the stats: during the World War II, allotments and gardens provided around 10% of food consumed in the UK because of the ‘Dig for Victory’ campaign whilst comprising <1% of the area of arable cultivation. Take a moment absorbing the significance of that statement. Home growing produced ten times the food per acre than arable farms! How can that be? Aren’t we told repeatedly, that we can only feed the world with grains? And that only intensive agriculture can deliver? Photo: woodleywonderworks. Creative Commons BY (cropped). Of course it could be argued that farming has become more efficient since WWII. Indeed, with the ‘green-revolution’ of the 50s and 60s intensive inputs, pesticides and high yield varieties increased the efficiency of arable farms, with the biggest impact seen on wheat yield, which increased seven fold. However, recent studies show that intensive farming does not come close to the levels possible from allotment and vegetable gardens. “More recent UK trials conducted by the Royal Horticultural Society and ‘Which?’ Magazine showed fruit and vegetable yields of 31–40 tonnes per hectare per year (Tomkins 2006), 4–11 times the productivity of the major agricultural crops in the Leicestershire region (DEFRA 2013),” says one paper. Not only are such small holdings more productive, but they provide a greater diversity of food, with a better range of nutrients, vitamins and minerals than do most commercial farms. Photo: Sunchild57 Photography. Creative Commons BY-NC-SA (cropped). 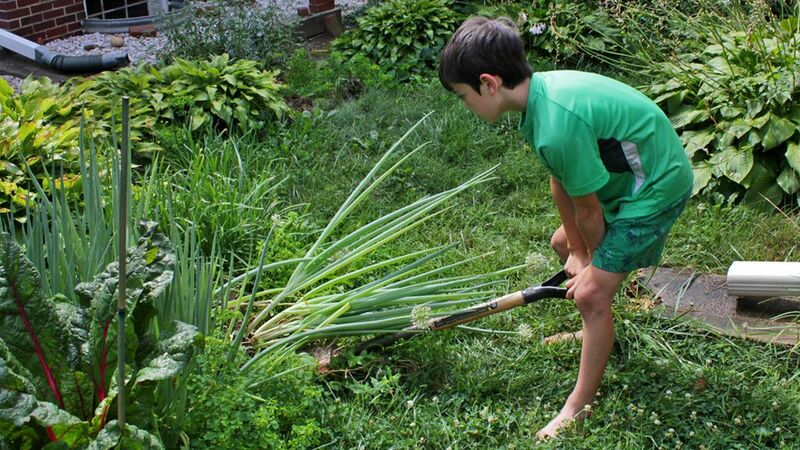 Amongst scientists, policymakers, the media and public, there is increasing awareness of the multiple benefits of ‘own-growing’ including access to nutritious fresh produce, stress relief, improved psychological well-being and physical fitness. 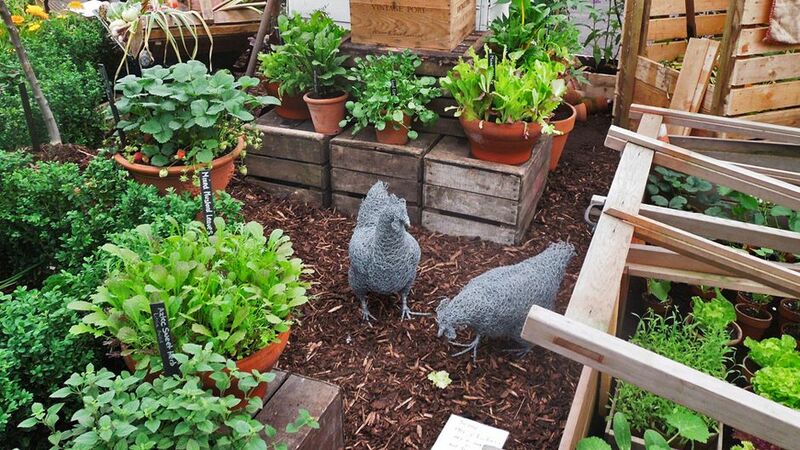 Living salads can be grown on the windowsill, allowing everyone to enjoy really fresh produce. My own experience of homegrown vegetables is that their freshness — straight from the garden to the kitchen — gives them a palpable quality of ‘aliveness’ that is simply missing from even the freshest vegetables in a supermarket, that is at best hours old. The exception to this are ‘live salads’ — punnets of cress, lettuce or herbs growing in a soil-free medium. I read a paper several years ago (which I can’t track down now), showing that these live salads had much higher nutrient levels than either organic or conventional ‘fresh veg’. They will stay fresh and grow happily on a windowsill, so at least some of the benefits of allotment gardening are accessible to everyone. 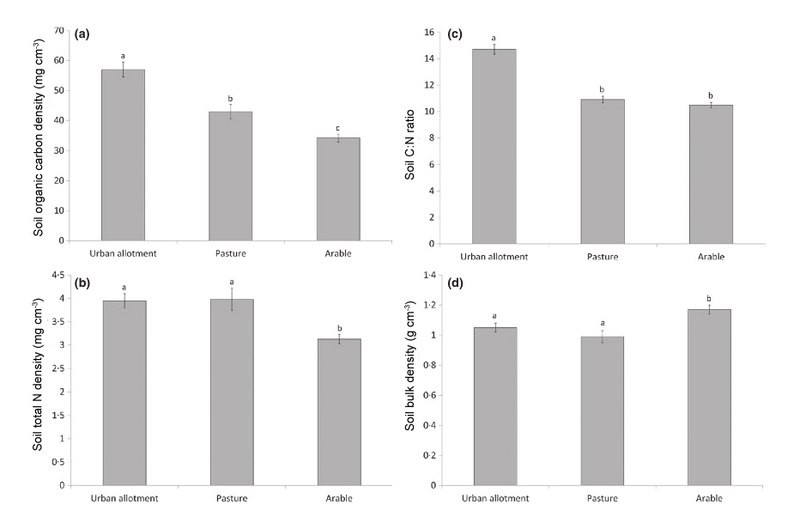 (a) Mean soil organic carbon density; (b) soil nitrogen density; (c) soil C : N ratio; (d) soil bulk density in urban allotment and agricultural soils. Error bars are ±1 standard error; letters show significant differences between land uses (Tukey’s test P < 0·05). Source: Edmondson et al., 2014. As you can see, the soil in the urban allotments was superior to the arable farms in every category (note that graph d is effectively measuring soil compaction, so higher = more compacted = worse). The authors ascribe most of the benefits seen in the allotments to on-site composting and addition of manure. Furthermore, ploughing — which is an essential practise only for arable crop production — gradually destroys soil carbon stores as it exposes them to oxygen which rapidly converts soil organic matter to carbon dioxide releasing it into the atmosphere. “…modern agricultural practices have degraded soil natural capital — which has profound implications for the loss of ecosystem service provision, including reduced structural stability, water and nutrient holding capacity and impaired regulation of nitrogen mineralization and supply to plants,” explains the paper. Gardeners and organic farmers have long claimed that natural organic fertilisers ‘build the soil’, in contrast to typical chemical fertilisers that provide soluble nitrogen that easily washes out of the soil, polluting water courses as a side effect. “…by applying artificial fertilisers soil carbon levels can fall further through lack of organic matter and reduced soil microbial activity,” explains another. UK farming is now engaged in trying to reduce its carbon footprint — a process that could make a huge impact on meeting national targets as soils are potentially a major carbon sink. For example, according to the Farm Carbon Cutting Toolkit, just a 0.1% increase in farm soil carbon levels would increase annual carbon sequestration by 8.9 tonnes of CO2 per hectare. The elephant in the room in this discussion is the pasture. Its soil carbon in the graphs above lies midway between allotments and arable farmland, but this is only half the story. Typically, much of UK lowland pastures are rotated with arable crops (ie, ploughed up regularly), so permanent pasture would be expected to have even higher levels of carbon than shown in the graph. Arable landscapes provide less amenity and environmental services than pastoral landscapes. Furthermore, pasture had the least compacted soil (think: more perennial roots, worms and soil denizens) whilst having similar nitrogen levels to allotments. This places it distinctly ahead of arable farming in terms of soil quality and all the associated ‘environmental services’ (water retention, CO2 sequestration, etc). What elevates its status further, I contend, is that it provides these with very little input. Allotments need compost, manure and a lot of human intervention. The lower productivity of permanent pasture compared to allotments and gardens is made up for by these reduced material and labour inputs. We should not forget the amenity aspect of pasture either: walking in a pastoral countryside is infinitely more pleasurable than navigating the soulless desert of a wheat field. In the end, a diet based around “meat and two veg” might well be the most environmentally ethical food production system, particularly if we grow more of our own veggies and rear our meat on permanent pasture. Throw in some seafood, and it’ll be the most nutritionally sound too. To finish — a picture of our vegetable garden showing that gardens can be beautiful as well as productive! You can read more about the gardens at Rosemary Cottage on my gardening blog.